The second talk was quite shocking, as Prof Larson detailed how the work of Francis Galton and others quickly led to the dominance of eugenics over theories such as ‘soft’ heredity and ‘blended heredity’ – the result was the emergence of repressive legislation on reproduction for the mentally deficient (segregation and sterilization) throughout northern Europe and the U.S.
Thankfully, the idea went out of fashion almost as quickly as it appeared, partly because of the horrors of Nazi Germany, and partly because of the emergence of scientific evidence that the model was deeply flawed. 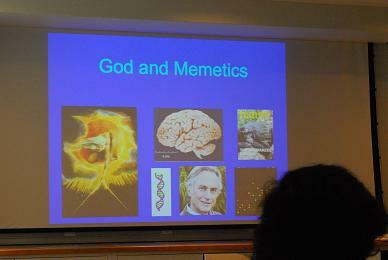 Denis Alexander, the director of the Faraday Institute, then gave a talk on ‘God and Memetics’, which consisited of an analysis of Dawkin’s theory of memes, and a discussion of the Dawkins description of religion as a ‘virus’. This was always going to be a lively talk and so it was. Dr Alexander had a field day dissecting the ‘virus’ theory in analytic terms (your humble correspondent pointed out at question time this might be a little unfair, as Dawkins probably uses the term in a metaphorical sense). More seriously, Denis also dissected the Dawkins ‘meme’ theory unmercifully, which I’ve seen a few biologists do recently. That said, he was very complimentary of many of Dawkin’s other ideas…more tolerant than vice versa anyway! jsut came across your blog recently after reading about it in Physics World. I’ve added you to my own blogroll if that’s okay. “Today was biology day, beginning with 2 talks by Pulitzer-prize winning science historian Ed Larson: ‘The Reception of Darwinism’ and ‘Darwinism, Eugenics and Religion’ . I won’t say much about the first (see the video here. Hi Noel, thanks for your kind comments and do please and to blogroll!